When in sulky mood, I usually count on a glass of tea to give me the boost I need, restore my wings. Or if that doesn’t help, I take the other way… I write. I don’t know if the title of this blog I review today is reflective of that, but I like it, for I can relate to it in a way. 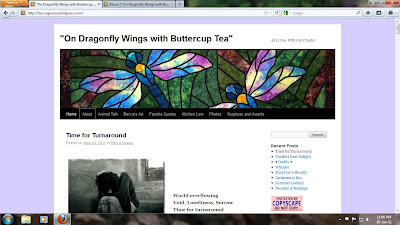 Review Tuesday’s brings to you the blog On Dragonfly Wings with Buttercup Tea, authored by Becca Givens. Becca Givens shares her passion for writing with us through the blog which she lovingly refers to as her passageway for Creative Rehab. She is a traveler on an awakening path to Christ-Consciousness and Oneness with an aim to maneuver through the journey grounded and centered, searching for a common thread. 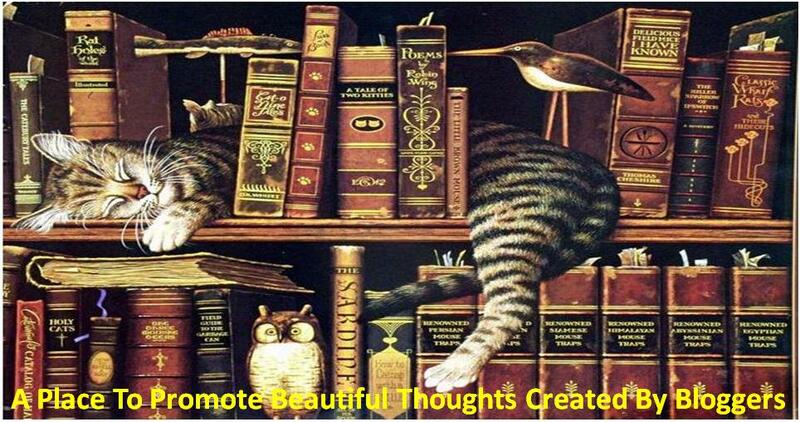 She welcomes her readers as she seeks to manifest her full potential as a divine creation to inspire, nurture, bring joy, happiness and peace to others as well as to her true self; all with an abundance of gratitude and for the highest good of all concerned. The look of her blog is simple: the default twenty-ten template of Wordpress with a header that matches the title to the T. The sidebar contains mainly badges that she has received, and the usual assortment of widgets like archive, email subscription, twitter follow button, counter and blog links to her favorite creative spaces like Potluck, Haiku Heights etc. According to the archives, she has been actively blogging since the beginning of this year. The menu bar contains links to pages, and also to her works of art, cooking etc. Any reader entering Becca’s poetic space doesn’t need to be a rocket scientist to see that her favorite and preferred form of poetry is the haiku and its associated forms like senryu, hay(na)ku etc. Mostly three line poetry I mean. The poetry is spread across on her home page itself, and it is in my opinion one of the most difficult forms to write. People look at a haiku and think that it is easy to write because it is just three lines. To express a lot in less is the most challenging thing. A haiku is seventeen syllables in all, and to express emotions like she does with those limited syllables is something I find to be amazing. Any poet looking to try haiku can visit Becca’s place for inspiration I feel. It gives them that range to grow. Becca, as suggestions, I only urge you to try other forms too. I can relate to a form being comfortable, but I see more in your pen than just haikus, so asking. I also suggest the tag cloud somewhere in that sidebar as it helps the reader to maneuver categorically. And lastly, maybe you can make a page for your awards too. It’d give your sidebar some breathing space. I loved to review your blog, and I hope the intro wasn’t out of bounds. I’ve been thinking since resigning the post from Review Tuesday last week. I’ve been at this place since the first week, and I’ve read and reviewed a lot of you fellow admirers of the written word. I never got to say a proper farewell to you all. When I heard from Jingle that there is no post that is due for this week till my replacement comes along, I thought I’d do the review of Becca, which I wanted to since long; and also say thanks to all of you as well. It has been a pleasure to be part of this awesome community from the first day, and I shall of course be part of it as a participant. Till the next time I’m part of JP blog as an official, this is my last review for now. This is Leo, from I Rhyme Without Reason, saying au revoir to you all. becca givens is a super inspirational and supportive. what a stellar official, leo. Yes, this is a wonderful review for a blog and a person whom I feel privileged to have met on the Internet superhighway. She is a real class act! Enjoyed this review, Leo, and always like visiting Becca's blog. Thank you for all the work you've done for this poetry community. Leo - OMG - what an honor! Thank you very much! Happy you visited!